A financial plan is somewhat of a formal process. 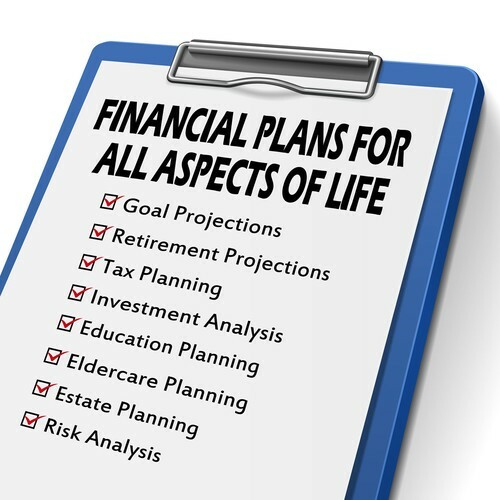 When an individual or business sets forth their financial goals and objectives, the financial planning process begins. A financial plan should be customizable and specific to the needs and desires of the individual or individuals involved. Getting a snapshot of cash flows and assets available for current and future goals is an important part of a financial plan. Most financial plans employ the use of sophisticated software programs. These programs can take in multiple variables and inputs to analyze cash in and cash out, taxes, investment returns, insurance needs, retirement accumulation needs, education funding needs, etc. Would you like assistance with your financial planning? For a Complimentary Planning Consultation, contact Jacki Imbrey,CFP®,RICP®, Richard Imbrey,CFP® or David Jeffries,CFP®,RICP® and we'll contact you promptly to schedule a convenient time for you to come see us.